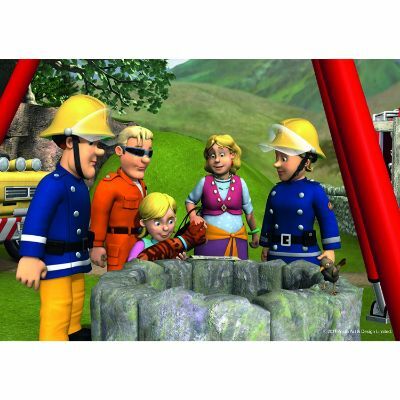 Fireman Sam is a popular British children’s show that follows the adventures of Sam, a fireman, and his fellow firefighters in the village of Pontypandy. The children’s show is a well beloved and long-running show that is aired in 155 countries and 35+ languages. Whether your child is a longtime fan of Fireman Sam or new to the show, Fireman Sam toys will bring great joy to their lives and develop a love and respect for firefighters. 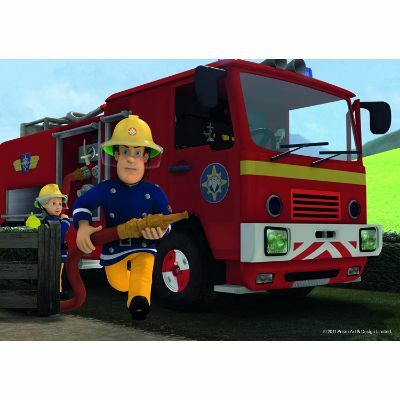 Plus, the problem solving and adventure nature of the show will help to stimulate the development of your child’s imagination and cognitive skills when playing with Fireman Sam toys. Welcome to our fresh new look! For this update, we focused on removing out of stock and unavailable products. We also upgraded out page structure to provide a better user experience. New review categories and evaluation criteria can be viewed throughout the page. Don't forget to voice your opinion by the most important criteria for you! Every child has their preference when it comes to action figures, whether they love to pose them, love stationary figures, or like large or small toys. This set happens to be of the flexible variety, which means kids can bend and pose them as they wish. These figurines will last a while and bear a striking resemblance to their on-screen counterparts. Once again, you can never have too much imaginative play! There’s nothing more kids love than to have their favorite characters at their own disposal, and these figurines look like they just stepped right off the screen and into your living room. These figures are little, but they are safe and easy to use. You’ll be getting a wide range of characters in this set that is made with good quality materials, which is really important when it comes to children and play time. They even bend at the knees! 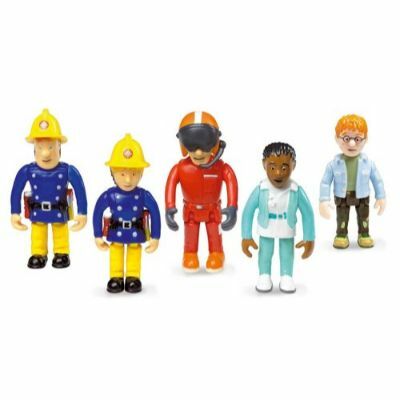 Five lovable characters come in this Fireman Sam set and it’s perfect to add to an existing set or a great starter for kids who don’t yet have Fireman Sam toys. Not too small and not too big. The Fireman Sam Plush Toy is a seventeen-inch tall plush toy. Perfect for showtime or naptime cuddling the plush toy is soft to the touch but very durable and sturdy. The Fireman Sam Plush Toy is a wonderful gift for Fireman Sam fans! The toy is safe for your child to play with as it’s soft but durable and tight stitching prevents any stuffing from falling out which can help prevent choking and contamination. Your child will learn how to understand friendship as this plush toy becomes their next best friend. The toy will also help enhance pretend play. It’s soft and cuddly but with strong stitching and can be easily played with without getting damaged. It can be perfect for pretend play and give your child a sense of friendship. Very colorful and Fireman Sam’s smile will brighten up any child’s day. Machine washable and perfect for bedroom decoration and safe for your child to sleep with. Little ones will love snuggling with this plush fireman Sam doll. It also inspires creative play! You don’t need to have a lot of figurines to have fun with them, especially if they’re big! These dolls are made of durable plastic. Having a larger-sized figure can increase a child’s willingness to play simply because the characters feel more realistic to them and are much more detailed. These toys fit perfectly in a child’s hand and while they are bigger, they’re still small enough to be taken along while traveling or to a friend’s house. While the plastic is strong, some smaller parts may not be safe for children. 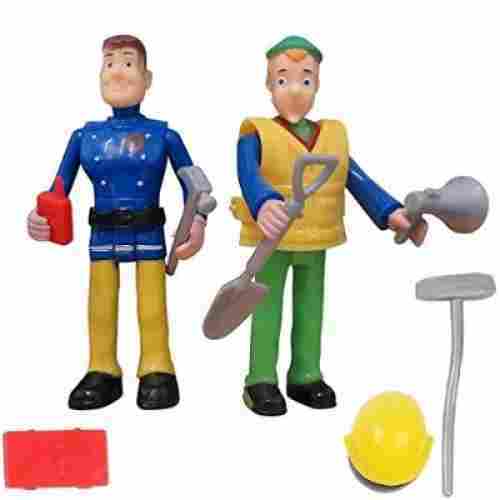 These five-inch figurines come in two-packs and represent two members of the Fireman Sam fire department, complete in full uniform and accompanying gear. They’re much larger than the average, smaller figures you would normally get in a set, which leaves more room for detail which you can see clearly on their faces as well as in their clothing. Their tools can be fitted into their hands, which are poseable and move to enhance creative play and make the toys seem a bit more realistic. That’s right...This fire truck lights up and makes sounds! That’s not all it does, though. This fire truck set is virtually all you need if you’re looking for something for the Fireman Sam lover in your life. The truck exceeds normal toy quality and ability and the addition of five fireman figurines definitely puts it over the top. Kids will learn imaginative and creative play with these awesome figurines. Maybe they will dream to be a firefighter one day! The small parts might not be safe for small children, but older kids will love it. Talk about a full set. This fire truck offers realism on a level that’s not often seen for the price you pay for it, and it even includes extras that normally don’t come with vehicle sets. It’s the perfect gift for any child, even if they don’t watch Fireman Sam and are just lovers of firetrucks in general. The ladder on this truck can be extended to perform even the most daring of rescues and it even has a bucket that kids can put their figures in to go along for the ride. It swivels as well to give kids the full 360-degree motion of a real-life fire engine ladder which is pretty awesome. To move it forward or backward, all kids need to do is push, because the wheels work as well. The truck itself is great quality and the best part? It comes with five Fireman Sam-inspired figurines! Great quality and very sturdy. Can drive on its own when propelled. Perfect for children who love fire trucks. The fire truck attachments can quite delicate and prone to breakage. The Fireman Sam Action Figure Sam Fire Truck toy comes with an action figure of Fireman Sam and his fire truck. The fire truck is friction powered meaning when the fire truck is push-forward multiple times it’ll propel forward with lightning speed. 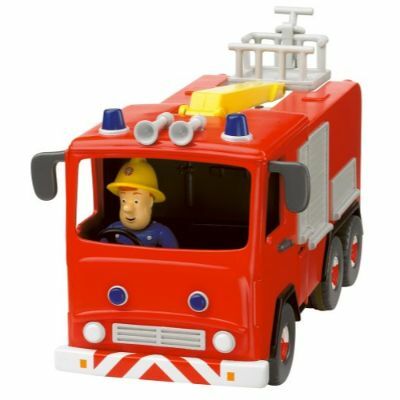 The Fireman Sam Action Figure Sam Fire Truck is a wonderful gift for Fireman Sam fans! The articulated operableness of the fire truck is a great way to teach children how a fire truck works and it can help give children a fun and safe experience of operating a fire truck. The ability of the fire truck to be self-propelled by pushing it forward is a wonderful interactive feature that can help develop an understanding of action=reaction relationships with objects. 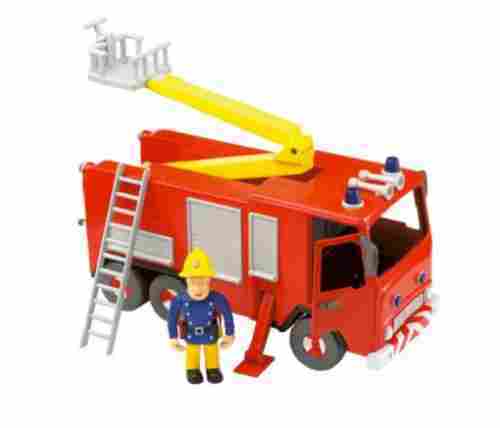 Having Fireman Sam included with the fire truck will add on the fun imaginative, pretend play fun. This toy does have several small parts, but it is made of safe materials. 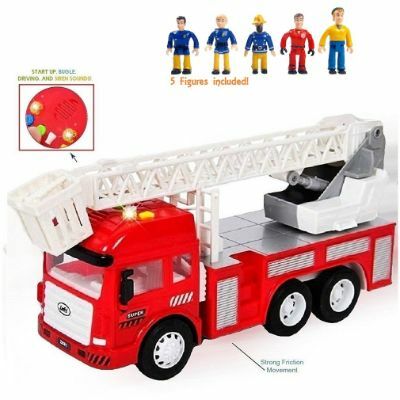 A crane arm, ladder and operable doors come with the fire truck making it a very interactive toy that can help develop the skill of operation. Lastly, an action figure Fireman Sam comes included and can easily sit in the firetruck. The fire truck is interactive and can help teach the basic functions of a fire truck. With it being a fun play toy it can also develop a love and admiration for fire trucks and their operators (firemen). Variety of puzzles to choose from. Puzzle pieces can present a choking hazard. 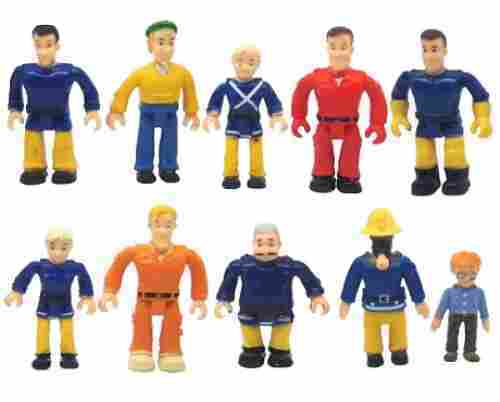 The Fireman Sam 9-in-1 Puzzle set comes with nine puzzles that have themed images of Fireman Sam saving the day. A storage case that’s easy to carry comes included making sure the puzzle pieces are never lost. This also ensures that the puzzle lasts for a while. 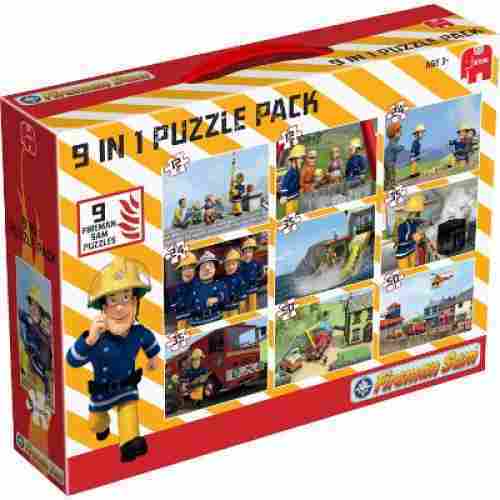 The Fireman Sam 9-in-1 Puzzle set is a wonderful gift for Fireman Sam fans! The puzzle set includes a variety of puzzles to choose from with great colorful images as the final result. Your child will develop their problem-solving skills as they learn how to put the puzzles pieces together starting from the basic 12 pieces to the advanced 50 pieces. The small pieces can be a choking hazard. The puzzle set comes in an easy carry storage box and the images are quite bright and vivid and represent different rescue scenes in the show. There are four sets of different size puzzle pieces (12 pieces (2), 24 pieces (2), 35 pieces (3) and 50 pieces (2)) and puzzles are crafted from durable cardboard. The four sets of different size puzzle pieces can help develop skill in puzzle solving which helps enhance observational and problem solving skills. Another great feature is the durable cardboard will help puzzle pieces keep their shape for a long time. Double set of Fireman Sam toys. Great for any Fireman Sam collection. Perfect for creative pretend play. Can be easily held in child’s hand. The action figures might not fit in all Fireman Sam toy vehicles. 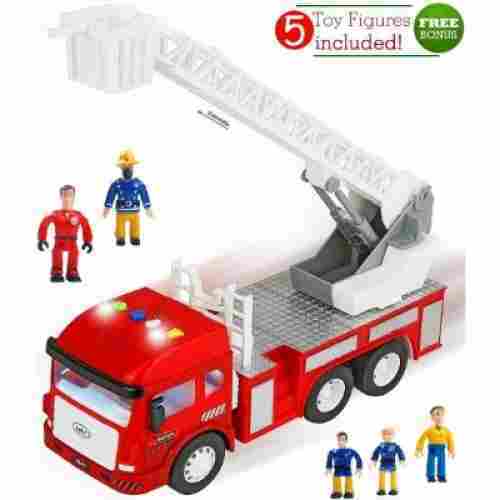 The Fireman Sam 5 Action Figures Fire Truck is a two pack toy that comes with a fire truck and five action figures. The fire truck is friction powered meaning when the fire truck is push forward multiple times it’ll propel forward with lightning speed and comes with a crane arm, operable doors, and a ladder. The poseable body parts of the action figures make for great action based fun that’ll ignite the imagination. The fire truck is interactive and can help teach the basic functions of a fire truck. 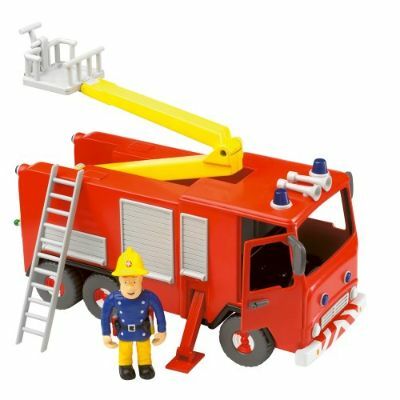 With it being a fun play toy it can also develop a love and admiration for fire trucks and their operators (firemen) and the action figures are great for any Fireman Sam collectors plus playable with other Fireman Sam toys and sets. The fire truck is a great way to teach children how a fire truck works and it can help give children a fun and safe experience of operating a fire truck with the self-propelled feature. For the action figures two Fireman Sams (one comes with the fire truck), Nurse Flood, Penny, Tom, and Norman are included. 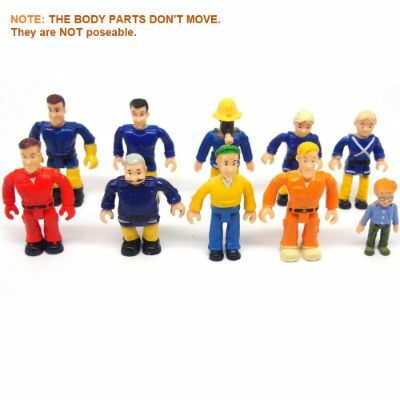 The five action figures are articulated meaning they have joints that allow action figure body parts to be moved and posed. In this set the head, arms and legs are poseable. 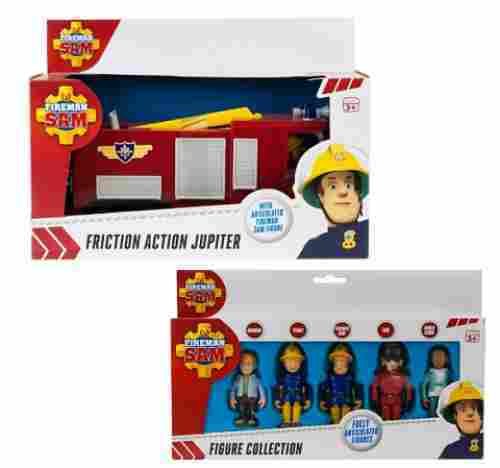 The Fireman Sam 5 Action Figures Fire Truck is a wonderful gift for Fireman Sam fans! This toy set brings double the fun as two Fireman Sam toy sets are included both benefit your child in a variety of ways. The rotating propeller is safe for play. Can “fly” on its own when propelled. Tom fits in easily but doesn’t stay put easily. Hard to fit Tom out of the small door opening. 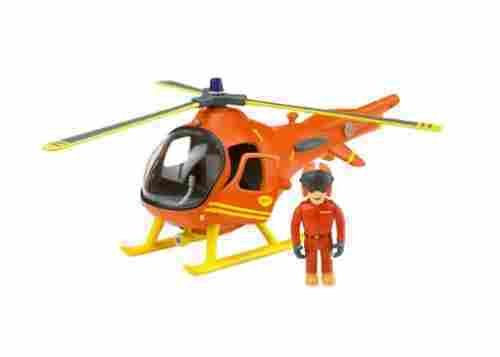 The Fireman Sam Action Figure Tom Rescue Helicopter toy comes with an action figure of Tom and his rescue helicopter. The rescue helicopter is friction powered meaning when the rescue helicopter is push forward multiple times it’ll propel forward with lightning speed. 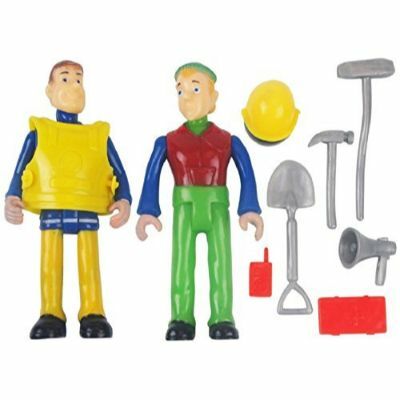 These fireman Sam toys are made of strong, durability materials that will last through days and hours of play. 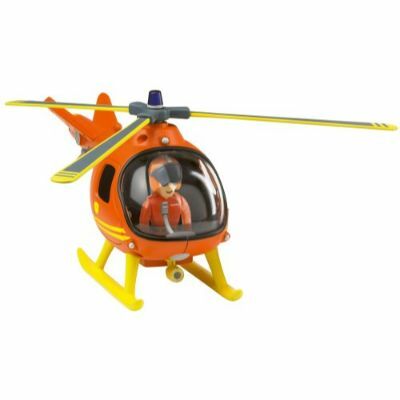 The Fireman Sam Action Figure Tom Rescue Helicopter is a wonderful gift for Fireman Sam fans! The articulated operableness of the rescue helicopter is a great way to teach children how a rescue helicopter works and it can help give children a fun and safe experience of operating a rescue helicopter. Operable doors and a rotating propeller come with the rescue helicopter making it a very interactive toy. Lastly, an action figure Tom comes included and can easily sit in the rescue helicopter. The rescue helicopter is interactive and can help teach the basic functions of a helicopter. With it being a fun play toy it can also develop a love and admiration for rescue helicopters and their operators (rescuers). The ability of the rescue helicopter to be self-propelled by pushing it forward is a wonderful interactive feature that can help develop an understanding of action=reaction relationships with objects. Having Tom included with the rescue helicopter will add on the fun imaginative, pretend play fun. You can’t reenact the role of Fireman Sam without him and the rest of his crew, right? 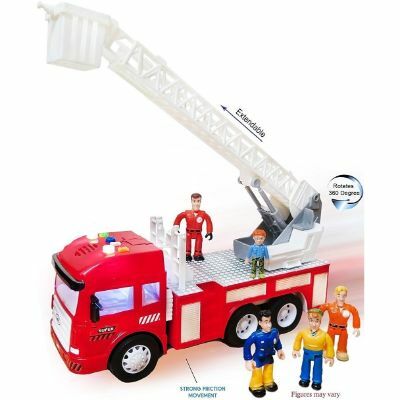 This FUNERICA fireman set is based on the show and comes with everyone your child needs to play out their favorite scenes from the show or create situations of their own. Every member of the fire department is pictured here and they’re ready to take on fires and save the town! These action figures are durable and while they’re not flexible, this makes them great to play with outside since they hold up well to the elements. These toys will teach them imaginative play and how to share with others. Parents don't need to worry about safety with these toys! For the price, the detail in these figures is pretty realistic compared to what you see on Fireman Sam and in real life. From the buttons on their shirts to the brightly-colored uniforms they wear, kids are going to love how accurate these tiny people are. The more characters your child has access to, the better their imaginative play will be. With a full set of ten figurines, the possibilities for various scenarios are endless and they’ll be able to play with their friends and siblings as well. A quality toy can last a very long time if not a lifetime. Any toys made of durable, sturdy and strong material are quality toys. Quality can also be intangible and a toy that can contribute to a child’s development, personal growth and imagination is a quality toy. Fireman Sam toys encourage make-believe and interactive play which is a great quality for a toy to have. A toy should help enhance a child’s development. Toys should encourage the development of cognitive skills, problem-solving skills, motor skills, numerical and language skills, sensory skills and imagination and creative skills. Fireman Sam toys will help to develop a child’s fine motor skills as the majority of the toys are operational and poseable. Fireman Sam toys will also help to develop a child’s imagination and creative skills as the toys are made for pretend play. Toys need to be safe and toxic free. Any toys made of fabric need to be flame resistant or flame retardant. Painted toys need to be painted with toxic free paint and any stuffed toys or fabric toys, in general, need to be washable. 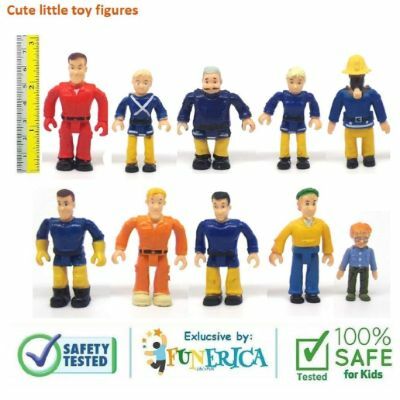 Fireman Sam toys usually meet these quality standards and most parent reviews give them a thumbs up in the safety department. Toys need to be easy to use and play with. Any toy that’s hard to figure out or too much work to play could end up frustrating the child. Toys that are easy to play with have a minimum amount of functions and simple steps to operate. Fireman Sam toys usually require little to no operation and any operation needs is very easy for children to learn and perform. Toys that stimulate are exciting toys that will keep a child excited for a long time to come. Stimulation can include touch and feel, sounds and lights, colors and images and interactivity. Toys that involve hands-on pretend play will help stimulate a child’s brain. Fireman Sam toys are very interactive and encourage hands-on touch and feel play experiences. The first thing we looked for in choosing Fireman Sam toys is authenticity. There are plenty of fakes of Fireman Sam and do not live up to the quality of real Fireman Sam toys and are much likelier to break, come apart and even injure a child. In choosing Fireman Sam toys, we make sure to choose toys that are only sold by reputable Fireman Sam resellers. Such resellers are usually based in the U.K.
Lastly, the interactivity and easy hands-on ability is an important criterion too. Most Fireman Sam toys offer a basic level of interactivity that is easy for a child to perform such as pressing buttons, grasping and moving pieces, putting Fireman Sam figures together with rescue vehicles such as the Fireman Sam helicopter or playsets and operating any accessories. This interactivity and hands-on ability will help develop fine motor skills, teach object relationships and even hand to eye coordination and problem-solving skills. Since Fireman Sam is a branded show, there is a large variety of selection that can be quite overwhelming. The most common Fireman Sam toys, however, are action figure, rescue vehicles, plush toys, puzzles and toys that simulate real-life firefighting equipment that Fireman Sam uses. Some Fireman Sam toys come in sets which give more than one option and are perfect for birthday or holiday gifts. q: Who is Fireman Sam? q: What can children learn from Fireman Sam? Fireman Sam is an adventure based rescue show. Children will learn important qualities such as teamwork, friendship, problem-solving and critical thinking, violence-free communication and respect for fellow humans. Children can develop an excitement for rescue adventures and respect for real-life rescuers. q: Can Fireman Sam toys be purchased in the U.S? Fireman Sam is a British show and the majority of its toys are sold in the U.K. It’s quite hard to find Fireman Sam toys in the U.S. and most parents have to purchase Fireman Sam toys from U.K. based sellers and resellers. q: Are branded toys okay for children? While there’s a debate if brand advertising hurts children, it’s accepted that it will never completely go away. As a parent, it’s important to limit your child’s exposure to brand advertising and have them understand that every product their favorite brand offers doesn’t need to be purchased. Since Fireman Sam is a show, it’s best to teach children that enjoying the show is more than enough and just one toy from the show is all that’s needed for enjoyment. q: How else can I discover Fireman Sam toys? You should start with the Born Cute “Best Fireman Sam Toys” list: Click the link of the Fireman Sam toy that interests you and when you arrive at the Amazon page for the Fireman Sam toy you selected, scroll down to the “Customers Who Viewed This Item Also Viewed” OR “Customers Who Bought This Brand Also Shopped For” lists. Those two lists can give you a great starting point in discovering other Fireman Sam toys. Another option is to stay up to date with the Fireman Sam official website and news related to Fireman Sam as that can help give notifications of any new Fireman Sam toys that are released. Speaking with parents of children who love Fireman Sam is a great option as well.